DIVE provides filmmakers with access to top-level talent and cutting edge tools Whether a studio picture, short film, full-length narrative or documentary, DIVE approaches all projects with a respect for the filmmaker’s vision and budget, and develops relationships to meet the individual needs of each film. In late 2006 Mark Forker joined DIVE as its Director of Creative Services and Visual Effects Supervisor bringing with him 15 years of Hollywood Visual Effects experience. Formerly VFX Supervisor at Digital Domain in Los Angeles, Mark has contributed his talents as a digital compositor and visual effects supervisor for some of Hollywood’s premiere Directors including Ron Howard, Peter Jackson, James Cameron, Tim Burton and Doug Liman . In 2007, DIVE expanded its Digital Intermediate capabilities by constructing its state-of-the-art Digital Cinema Theatre with full integration between the DI and Visual Effects platforms. In 2008 DIVE brought on Ed Mendez as Compositing Supervisor to lead DIVE’s compositing team. Ed’s credits include The Matrix: Revolutions, Spider-Man 3 and the Emmy award-winning HBO mini-series John Adams among many others. Ed is now also handling VFX Supervision (on set and in Post) on some of DIVE’s projects. Imagineer Systems spoke with Ed recently about their recent projects, some of their more challenging sequences and the tools they use to deliver such amazing content. We use mocha pretty extensively at DIVE, mainly for the Planar Tracking and roto capabilities. In fact, there are a number of projects on which mocha and mocha Pro played a significant role. Some of those projects include: Do No Harm, After Earth, Silver Linings Playbook, Chernobyl Diaries, Safety Not Guaranteed, Safe, I Am Number 4, Let Me In. We have some fairly high end tools in our workflow, so it’s so important that mocha integrates so nicely with our Nuke and Smoke systems. For Do No Harm there were a series of shots where the main character needed to have bloody knuckles added digitally to his hands. We used mocha to track his knuckles/hands. Because of the perspective changes on the hands, these shots would have been extremely difficult to try to track this with a traditional or 3D tracker. mochacalculated the perspective changes and we exported that corner pin info out of mocha and into nuke. This allowed our artist to seamlessly add our bloody knuckles texture back onto the hands. mocha saved us time and helped us get the look we needed to make these shots believable. There’s another feature that’s also worth mentioning because it’s something we use all the time. Paint work which would normally require spline or grid warping to match perspective, can now be achieved utilizing mocha‘s planar tracker. 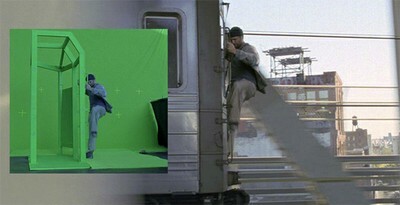 The Tracker seamlessly calculates perspective changes and applies this info into a corner pin that we can use in nuke. The ability to export tracks straight to the clipboard and pull that info directly into other packages couldn’t be easier. Mocha also makes it very easy to adjust corner pin tracking allowing the slightest sub-pixel adjustments. When looking at the work we do, it is not about individual shots, but more about the bodies of work. mocha has helped us deliver large volumes of high quality work within tight deadline schedules. We are able to track shots quickly, and more importantly, accurately. The time artists save on tracking allows compositors more time to give their shots that comp love needed to hit final. mocha has helped us deliver 30-60+ shots per episode on Do No Harm. Hitting the fast pace of a TV schedule averaging about 2 weeks per episode. mocha helped us deliver 175 shots in 6 weeks on Silver Linings Playbook – that’s pretty huge!